Hey, what’s going on everyone? This is Chris from StrategyBeam, and today we’re going to look at how to do specific keyword research to improve your business SEO and drive more qualified leads to your site so you can make more money. The first thing we want to look at is what keyword research is and how it works with SEO. This is really where the magic happens and where the rubber meets the road. Keyword research and SEO marketing content communicate answers people go to Google to ask questions. As a Business Owner or a Marketing Director, it’s your role to answer those questions with content that provides those answers. Google also relies on content to understand pages, and it’s important to understand that pages rank in Google and other search engines. Websites don’t rate, so you want to optimize website content for specific search queries. Thinking about specific questions that people are asking is the best starting point for keyword research, and since your business offers the best products and services to address the needs of your customers, you need to align the content you produce with the requirements of your customers. That just brings over to the fourth point, which you could argue is the most important point. Your content has to align your content to the needs of your business because your company wants to make money. This means that keyword research needs to work for your business. What are some of your customers’ most frequent questions, and how can you help them achieve their goals? Search queries that people type into Google are questions that people want to know. They also turn to Google to address needs that they need to fulfill, and as these search queries grow, you can look at what the customer needs. User intent is above all else the most important thing for Google because they want to provide relevant information to combat Facebook, Twitter, Yelp, and all these other sources that are competing with Google for traffic and ad spend. You want to align this content with the goals of your company instead of just making content willy-nilly you want to make sure that it’s driving towards conversions. Your content needs always to fulfill your needs, so your content strategy is still making you money. If your Internet marketing strategy is making you money, then you can continue to create high content to answer questions that your customers are asking. Finally, you want to rank in Google, because this drives qualified traffic to your site. The higher you rank in Google, the more likely you are to get qualified links and make that money. You want to look at keyword research to help you succeed with online marketing because keyword research and SEO marketing is a holistic approach to how you can drive qualified traffic to your site, so people convert. 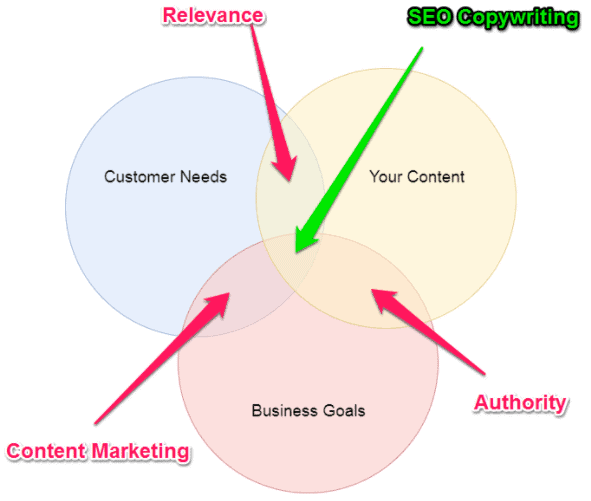 Here is a sample graph that shows three components of SEO copywriting which is part of keyword research. We look at SEO copywriting a lot deeper in another video, but I just wanted to do a quick overview here. Customer Needs: This is what people are asking your content this is what you’re producing it to answer questions. Business Goals: This is what makes you money so between customer needs and content is relevance you need highly relevant content to get ranked. Business Authority: Between your content and business goals is your authority. This is really what proves to people that they could trust you. Content Marketing: This is that sweet spot between customer needs and your business goals. As you build out your content, you want to make sure that this overlay is accomplished. Right in the middle is SEO copywriting which is crucial. Here’s an example of the process I follow whenever I build out a page. I always think about what people are looking for and what they’re going to type into Google Search. There are some ways that you could go around finding actual search queries from third-party tools. A search term like best Chinese food is probably pretty local. This search query identifies that I’m hungry, I don’t know what to cook, so I want to know where is the best Chinese food near me. Let’s say you’re a marketer looking for a new laptop you might go to Google and type in something along the lines of I’m a marketer, and I want to know what’s the best laptop for my needs. This search query shows is that you’re a marketer, you need a computer, and this person wants to know what’s the best laptop for their needs. It’s the same with dog food reviews I have a dog, I need to get dog food, and what’s the best dog food for my pet? SEO reports on the business show that I need an SEO report, so I want to know what I should look for in an SEO report for my business? Then gym workouts which you see at the beginning of the year because people want to get fit and they don’t know what to do. This is an opportunity for your business to answer their needs while establishing yourself as a thought-leader and trusted source. These are informational, transactional, and other different levels of user intent based on the search queries. We won’t go into today these different types of user intent today because this is a little bit more high-level but this is the starting point for keyword research. Once you understand the questions people are asking, you want to start to unearth some of the keywords that you could use the SEO content. As you optimize your content to rank in search engines, you should you focus on the long tail or short tail keywords for your content efforts. Short tail keywords are things like Nike shoes, which are highly competitive. They have a lot of search volume, but they don’t show a lot of user intent. Long tail keywords are like women’s running Nike shoes. These types of keywords have more words in them, so people have to be more specific in what they’re looking for. Customers using long tail keywords are much closer to the point of purchasing a product, so you know being more specific. This shows better user intent and long tail keywords have better user intent. They also have less competition, so you don’t have to compete with the big guys to rank. Just as a general rule of thumb, I always recommend that you don’t focus only on search volume, and still go for lower competition rather than high search volume. Which Keywords Should You Focus On? A lot of SEO copywriters and SEO marketers tend to just look at the high search volume, but that’s the wrong way to look at it. You want to look at user intent since people pay you and they give your business money. Google doesn’t provide you with money, so you want to make sure that your ranking for what people need. This way your customers can convert on your site. Here’s a quick overview of short tail keywords versus long tail keywords. We can see that when it comes to search volume, short tail keywords win, but with every other metric that you could look at for verifying and validating keywords, long tail keywords win. Bottom line? It’s always better to focus on long tail keywords. So, how do you find these high keywords? Well, the first way you could do that is to take a structured approach to find the gold in the mountains. You want to start with a base seed keyword. For example, you could use the term travel luggage or something similar. Once you have this keyword, you want to run this through SEMrush and even Keyword Planner. Keyword planner isn’t great for organic research, but if you’re trying to do this process with minimal costs, then that’s a pretty good tool. 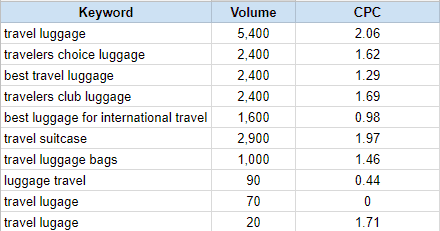 Then check the keyword competition and search volume. 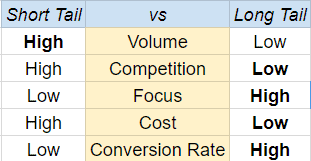 Next, you want to record all these metrics and comparisons in Excel and then rinse and repeat until you have a list of keywords that you are comfortable with. Look for terms that stand out as potential targets for your keyword research. Keywords that have lower search volume but that also have a lower Cost Per Click (CPC) are the best choices to go for with SEO copywriting content. You can use the CPC metric to understand how competitive a term is because keywords with higher competition mean that more people are searching for that term. As more people search for a given name, Google is going to charge you more to get shown. You can use the CPC metric as a roundabout way to estimate how competitive that term is. On the right-hand side of the SEMrush display, we have related keywords. One thing that you’ll notice is that the bottom two names contain typos. This results in these terms having lower search volume, but the competition is way more economical too. That’s one trick you could use in your SEO copywriting as you do keyword research. Think about any typos that people might frequently use and then integrate those spellings into your SEO copywriting strategy. This approach is one way that you can use typos to your advantage. Once you find this information, just go ahead and write that into an Excel document for your records. With this information, you want to go ahead and build out specific pages on your site. I like to use about three primary keywords and two LSI keywords on each page. I have found that this gives a pretty good footprint for Google to understand the content. 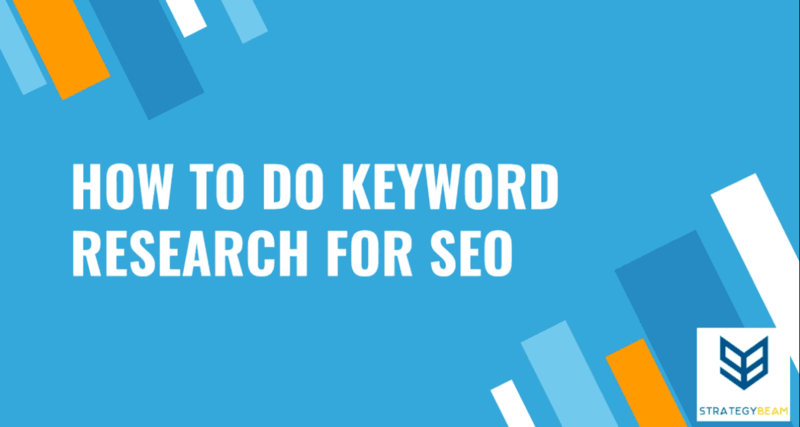 There’s also another way to do it which is great if you’re just getting started and you don’t feel comfortable conducting keyword research from the beginning. This approach is reverse engineering what your competitors are doing so the way that this works. To do this, you reference look-alike websites. These websites are either sites that are like yours or direct competitors. With a list of a few competitor sites, you review those websites in SEMrush. By doing this, you could pull in pretty valuable data from SEMrush to understand what keywords your competition is ranking for. Once you find a list of keywords from your competitor sites, you want to look for low competition. Then you can write those keywords down in your Excel spreadsheet to start ranking and optimize based on your needs around the goals of your business. Leverage Great Keyword Research For Amazing SEO Today! So there you have it guys. Thanks a lot for your time today as we went over keyword research and SEO copywriting. Please go ahead and give a comment on this video, like the video, and please subscribe to our channels. We’d also appreciate it if you could go ahead and share this with your friends because it helps us out a lot. If you have any questions feel free to reach out in the comments or shoot us a message throughout Contact Form on our site. We would love to hear more about how you do keyword research or any questions that you have about this topic. Thanks a lot for your time, and now go out there and do some excellent keyword research and write some excellent copy and make that money!